Sparkler send-off’s for the bride and groom can still be a great way to end an already wonderful evening filled with friends, family, and that extra spark (get it spark – LOL). There are many do’s and don’ts for a sparkler exit if you want to make it flawless. 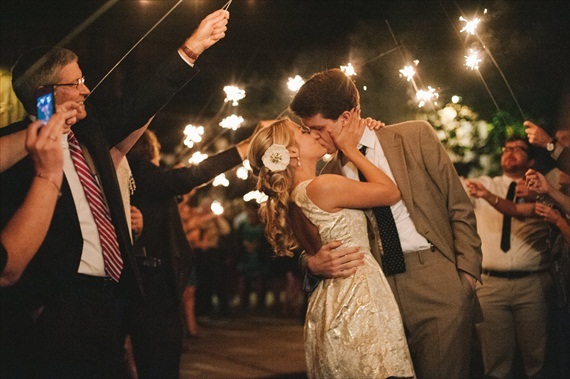 Here is how to do a wedding sparkler send-off that everyone will remember for a long time. We have so many great venues here in Missouri that allow outdoor sparkler send-offs and this Missouri Wedding DJ can help! Here are our TOP hints to help pull off that perfect Missouri Wedding Sparkler Send Off ! 1. Verify with the venue if you are permitted to hold a sparkler send-off. If your event is an outdoor reception check with the parks dept., municipality or borough for permission. Some areas you are not permitted due to potential fire hazards as in very dry areas. And a Special permit could be required. We only recommend outdoor sparkler send-offs for the safety of all guest and venues. 2. Take a look near the area if there are any smoke alarm devices in the ceiling or over hangs. Think of a back deck area, it’s outside but still within the venue’s structure. These will have to be turned off just in case or move the send off further out. 3. Purchase the long sparklers, not the short ones that last 15-30 seconds. You can buy them in bulk but get no more than two per guest. Plan on giving each guest two sparklers each but instruct them to only light one at a time. They can light the second one off if the first as it nears the end. But ONLY light when instructed by photographer or DJ/MC. 4. Include in your shopping to get several lighters. Matches require two hands to light and will burn down quickly. If you give a lighter to every sixth or seventh person you should be fine. Honestly, these types of sparklers light faster off of each other than a lighter. 5. Only give the sparklers and lighters to your wedding DJ/MC or Photographer and have him/her hide them until 30 minutes from the end of the night. Instruct your maid/matron of honor to pick them up and along with the bridal party make their way to the exit area. 6. Have your photographer take you two outside at some point when it gets dark to do a few sparkler photos. A good photographer can set their camera on a stand with the lens wide open and photo you drawing a heart in the air with 2 sparklers. Other options would be to spell out love or some other short phrase. 7. Have your DJ to make an announcement that we will be having a wedding sparkler send-off so be sure to get your sparklers just before making their way outside. About 15 minutes from the close of the evening instruct all guests to make their way to the location. 8. Have the disc jockey play a few “fire” related songs such as Katy Perry’s “Firework”, Talking Heads “Burning Down The House”, Parliament’s “Fire” etc. Try to set the mood for the romantic getaway. 9. Make sure to have one or two metal cans or large pots filled with sand for guests to stick the burnt sparklers in after the show is over. Safety and keeping the venue’s grounds clean is important. These can be placed on the side away from the building or near the area guests will be heading back in to collect their belongings. 10. Timing is the key for a perfect sparkler send-off so all guests will need to be properly instructed. 11. Have guests form two rows side by side about 10 feet apart starting at the doorways out to the parking lot where hopefully the limousine or party bus awaits your departure. I say 10 feet because when guests extend their arms outward so as not to be burned by the sparks the bride and groom will be left with about six feet to pass. 12. Get the bridal party lined up first so all others can follow in the example, give out the lighters and be clear not to light them until they are told to do so. The window of opportunity is very slim for this. Now with the newlyweds ready to embark upon their new life, We can announce lighting the sparklers. 13. Give everyone about 15-20 seconds then with the majority of sparklers lit the couple can start walking out passing thru the bridal party, parents then guests. Guests will be cheering and waving their sparklers around making a grand exit for the couple. 14. Be sure to stop about halfway thru for a romantic kiss, perfect for a great picture from the photographer or a few guests with their phones. Once completed they may finish their exit. Guests may light their second sparkler off of the first giving enough time to make this a grand departure. 15. Have someone in charge of collecting any garbage from the wrappers (sparkler and lighters) along with the burnt sparklers. Give them to a maintenance member for proper disposal. 1. Don’t assume you can do a sparkler send-off anywhere. Check with the venue/management/local govt. 2. Don’t believe you can buy sparklers anywhere and transport across state lines. In some states this is illegal. 3. Don’t think a standard sidewalk is enough space for you. Sparklers give off sparks, sparks burn, sparks can set some material on fire quickly. Have water on hand! 4. Don’t plan on buying a lot, as stated above 1-2 per person is sufficient. 5. Don’t plan on guests having lighters. Many people no longer smoke and paper matches don’t light sparklers well. 6. Don’t set the sparklers out too early. A few guests may decide to start the fun early and waste them. Then we did all this work for nothing! 7. Don’t rush, allow for enough time to get everyone in line and ready, and don’t dilly-dally around when your DJ says it’s time to go. 8. Don’t assume someone will take a picture. Designate a few folks, front, and rear for some captivating images. Many Photographers are gone by this point. 314DJ can HD Record with GoPro or Steady Camera as an add on option. 9. Don’t trash the venue with left over sparkler sticks. Have someone clean up as best possible so other couples in the future will be allowed to do the same. Some venues keep the deposit if sparklers are left on the ground. 10. Don’t let small children handle sparklers. You can give them some glow sticks so that they may join in the fun. Your St Louis DJ Stocks Glow Sticks.